Physics Drop by IDC Games walkthrough, cheats, solutions for android and ios devices. 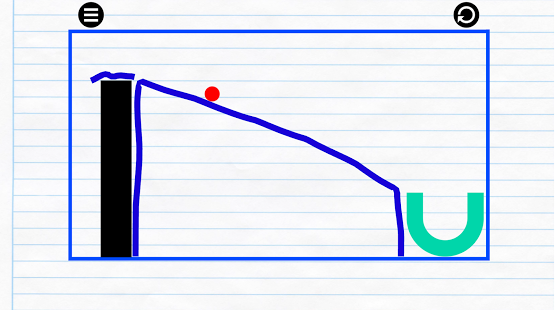 Physics Drop is a physics puzzle game with a simple goal: get the ball inside the "U". You will have to draw lines, angles, squares, rectangles or any other shape you can think of in order to reach the goal. Currently there are 70 unique levels you need to solve in order to complete Physics Drop, and new levels are added periodically. Some of the levels will prove impossible to solve, without some help, and this page will help you beat all of them. Just pick a level below to see a detailed, step by step, walkthrough and a video demonstration on how to solve that level. Physics Drop Level 90 Walkthrough, Solution, Cheats for Android, iPhone, iPad, iPod. Physics Drop Level 89 Walkthrough, Solution, Cheats for Android, iPhone, iPad, iPod. Physics Drop Level 88 Walkthrough, Solution, Cheats for Android, iPhone, iPad, iPod. Physics Drop Level 87 Walkthrough, Solution, Cheats for Android, iPhone, iPad, iPod. Physics Drop Level 86 Walkthrough, Solution, Cheats for Android, iPhone, iPad, iPod. Physics Drop Level 85 Walkthrough, Solution, Cheats for Android, iPhone, iPad, iPod. Physics Drop Level 84 Walkthrough, Solution, Cheats for Android, iPhone, iPad, iPod. Physics Drop Level 83 Walkthrough, Solution, Cheats for Android, iPhone, iPad, iPod. Physics Drop Level 82 Walkthrough, Solution, Cheats for Android, iPhone, iPad, iPod. Physics Drop Level 81 Walkthrough, Solution, Cheats for Android, iPhone, iPad, iPod. Physics Drop Level 80 Walkthrough, Solution, Cheats for Android, iPhone, iPad, iPod. Physics Drop Level 79 Walkthrough, Solution, Cheats for Android, iPhone, iPad, iPod. Physics Drop Level 78 Walkthrough, Solution, Cheats for Android, iPhone, iPad, iPod. Physics Drop Level 77 Walkthrough, Solution, Cheats for Android, iPhone, iPad, iPod. Physics Drop Level 76 Walkthrough, Solution, Cheats for Android, iPhone, iPad, iPod. Physics Drop Level 75 Walkthrough, Solution, Cheats for Android, iPhone, iPad, iPod. Physics Drop Level 74 Walkthrough, Solution, Cheats for Android, iPhone, iPad, iPod. Physics Drop Level 73 Walkthrough, Solution, Cheats for Android, iPhone, iPad, iPod. Physics Drop Level 72 Walkthrough, Solution, Cheats for Android, iPhone, iPad, iPod. Physics Drop Level 71 Walkthrough, Solution, Cheats for Android, iPhone, iPad, iPod. Physics Drop Level 70 Walkthrough, Solution, Cheats for Android, iPhone, iPad, iPod. Physics Drop Level 69 Walkthrough, Solution, Cheats for Android, iPhone, iPad, iPod. Physics Drop Level 68 Walkthrough, Solution, Cheats for Android, iPhone, iPad, iPod. Physics Drop Level 67 Walkthrough, Solution, Cheats for Android, iPhone, iPad, iPod. Physics Drop Level 66 Walkthrough, Solution, Cheats for Android, iPhone, iPad, iPod. Physics Drop Level 65 Walkthrough, Solution, Cheats for Android, iPhone, iPad, iPod. Physics Drop Level 64 Walkthrough, Solution, Cheats for Android, iPhone, iPad, iPod. Physics Drop Level 63 Walkthrough, Solution, Cheats for Android, iPhone, iPad, iPod. Physics Drop Level 62 Walkthrough, Solution, Cheats for Android, iPhone, iPad, iPod. Physics Drop Level 61 Walkthrough, Solution, Cheats for Android, iPhone, iPad, iPod. Physics Drop Level 60 Walkthrough, Solution, Cheats for Android, iPhone, iPad, iPod. Physics Drop Level 59 Walkthrough, Solution, Cheats for Android, iPhone, iPad, iPod. Physics Drop Level 58 Walkthrough, Solution, Cheats for Android, iPhone, iPad, iPod. Physics Drop Level 57 Walkthrough, Solution, Cheats for Android, iPhone, iPad, iPod. Physics Drop Level 50 Walkthrough, Solution, Cheats for Android, iPhone, iPad, iPod. Physics Drop Level 56 Walkthrough, Solution, Cheats for Android, iPhone, iPad, iPod. Physics Drop Level 55 Walkthrough, Solution, Cheats for Android, iPhone, iPad, iPod. Physics Drop Level 54 Walkthrough, Solution, Cheats for Android, iPhone, iPad, iPod. Physics Drop Level 53 Walkthrough, Solution, Cheats for Android, iPhone, iPad, iPod. Physics Drop Level 52 Walkthrough, Solution, Cheats for Android, iPhone, iPad, iPod. Physics Drop Level 51 Walkthrough, Solution, Cheats for Android, iPhone, iPad, iPod. Physics Drop Level 49 Walkthrough, Solution, Cheats for Android, iPhone, iPad, iPod. Physics Drop Level 48 Walkthrough, Solution, Cheats for Android, iPhone, iPad, iPod.